Only in France would you find an annual Omelette Festival, a monthly Crab Fair, an Avocado Festival, a Festival of the Yam… Well, to be more precise, you’d actually find it closer to home in New Caledonia, a little slice of France on our own back doorstep. The flavours of France are everywhere in this small Pacific Island nation, from huge coffee plantations to delicious crème brûlée.The aromas of France permeate the local cafes, bars, restaurants and markets that instantly remind you of everything François. It’s possible to sample classic and cutting edge cuisine every night, if that’s your fancy. At the other extreme, DIY picnic feasts and self-catering options abound. There’s even an Escoffier cooking school here, for those who want to sharpen their culinary skills. There are many excellent hotels and restaurants with top-notch, French-trained chefs, offering classic food and fine-dining menus. Simpler eating options include bistro fare and café food – numerous casual eateries are spread along the Baie des Citrons (Lemon Bay) and Anse Vata, where many of the tourist hotels are situated. Dotted about the waterfront and at Port Moselle, you’ll even find some road-side caravans, called ‘roulottes,’ that sell simple, tasty take-out meals and snack food. Eating and drinking in New Caledonia is to enjoy life, their unique and some say delicious cuisine considered to be among the best in the South Pacific. An integral part of dining out and experiencing food in New Caledonia is to embrace the French-like daily routine. Don’t sit in your hotel everyday and eat from the English menu – venture out into the narrow streets and savour the lifestyle that’s been around for over 150 years. Much of the food in New Caledonia is based on French-style home cooking, and both coffee and wine are as important to locals as Bastille Day or the Tour de France. Having claimed New Caledonia in 1853, the French influence is everywhere. Over the years, the colony has justifiably developed a unique distinctiveness and its own style of cuisine. In Chez Marmi, out in the country north of Noumea, we sampled some truly authentic food around the back of a local house, flanked by a babbling brook. The ‘table d’hôte lunchtime menu was sea snails, coconut crab, pork with rice, veal and a pork terrine – and the food just kept on being served. A short plane flight or a ninety minute ferry ride from Noumea gets you to ‘Isle de Pines’, a place so peaceful and secluded you’d think it was uninhabited. At the rustic looking Le Gauries, we ate lunch seated at a long wooden table by the beach under arching pine trees; they only serve one dish here: fresh lobster with rice and a small salad. We justifiably ordered a bottle of le Gauries Bordeaux Sec White dry 2005 to accompany our meal. Seafood is of course available everywhere and in many varieties. 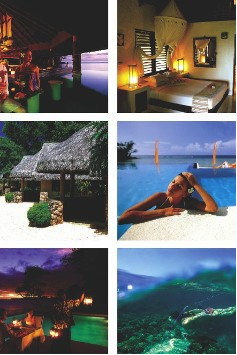 In Noumea there are about 130 places to dine out, from snack bars and sidewalk cafés to elegant restaurants. You’ll find international cuisine (or a variation thereof), Spanish, Mexican, African, Italian, Indonesian, Japanese, Chinese and Vietnamese. Lunch one day was at La Fiesta on the sidewalk in Noumea looking out across the beach. Over a bottle of Muscadet Sur Lit we indulged in Marmite de Madam pot-au-fer de la mer en croûte, translated: Mum’s seafood stockpot with pastry crust. This is as typical as it gets in New Caledonia and it’s easy to laze away an afternoon on the sidewalk discussing the country’s passion for the game of boules. Simply the best way to enjoy breakfast is down at Noumea’s waterfront market at Port Moselle. Under one of the domed roofs we ordered a Buvette du café (coffee) and croissants. I was reminded of markets in Africa, a melting pot of people, races, sounds, smells, foods and handicrafts. On the outside edge, stallholders sold trinkets and colourful shawls, while inside the food hall there was a huge variety of wild fruits on sale; elsewhere breads, salads, pate, terrines, foie gras, sausage, meats, seafood, and even New Zealand mussels. Bougna is the traditional Melanesian dish of New Caledonia and it’s definitely worth trying once, but beware … it’s not to everyone’s taste. It’s a combination of lobster, chicken, or fish with yams, sweet potatoes and bananas wrapped in banana plant leaves. The food is then steamed in an earth oven heated by hot stones, in some ways similar to a Maori hangi. Located at Baie de l’Orphelinat we found Maison Ballande, a store selling an excellent range of gourmet products. The shop is amply stocked with fresh local produce that shares space with an equally impressive wine selection. 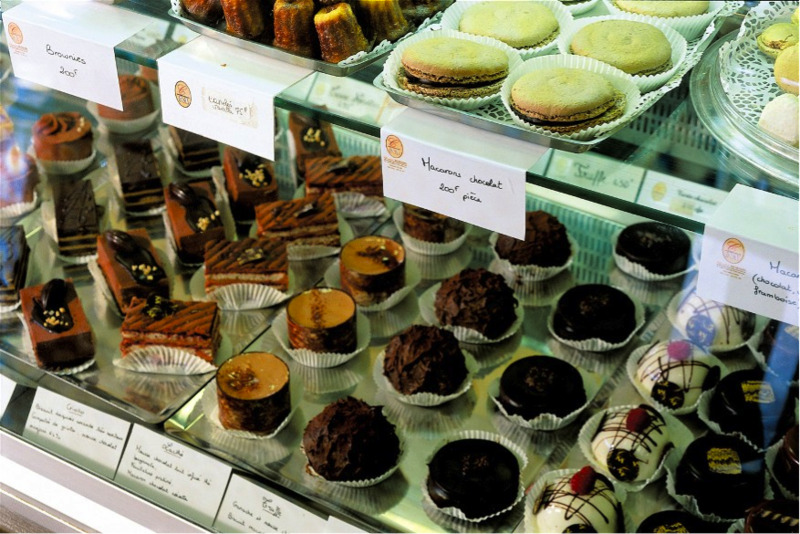 For chocoholics, drop into Chocolats Morand at 9 rue Porcheron, in the Latin Quarter, specialising in beautiful handmade chocolates as well as cakes. Tonton Jules is another excellent chocolate shop on the other side of the Place des Cocotiers, where they often feature a spectacular chocolate fountain in the window. A well-known and highly visible restaurant is the Le Roof. Set over the water in a building representing a traditional Melanesian tribal hut, Le Roof offers some of the best views of Anse Vata, and sometimes dolphins or turtles can be seen swimming by. They serve excellent wines and creative cuisine. There’s a fun bar and nightclub in the same complex. A story on New Caledonia would hardly be complete without mentioning what France prides itself on, their cheeses. Estimates say there are about 700 different cheeses produced in France today, although we get the chance to taste only a few of these in New Zealand. 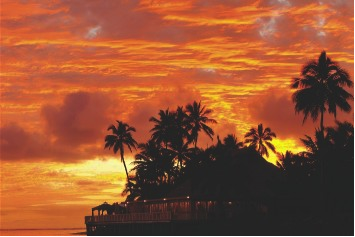 There are numerous delectable choices in Nouméa – more than enough to fulfil your inner connoisseur. So add a good block of fromage, some olives, tomatoes and salad, a large Baguette, some fruit and a nice bottle of wine to your picnic hamper and enjoy – voila. Go to the daily markets wherever you are based – they are cheaper, varied, and fun to visit! ?French products are cheaper than imported ones and you’re there to try new things. Take your own picnic set – you will use it! Snack vans on the roadside or beachside are reasonably priced and offer good quality with varying menus. Take a re-useable water bottle – tap water is safe to drink and tastes good! There are several supermarkets in and around Noumea, varying in size and product selection. Be aware that while their selection of cheeses, wines (some are reasonably priced for about NZ $20) and other products may be extensive, their fruit and vegetable section may not contain much at all and is often mostly imported produce of dubious quality at high prices. • Geant – on rue Taragnat, Ste Marie approx 2kms from city centre – a huge place, similar to K-Mart, but with a supermarket inside selling every imaginable food item. • Carrefour – on the Voie Express north of Noumea – if you are headed out of town on a day trip this would the best one to go to. • Super-U – on route de l’Anse Vata is smaller than others but it has a fantastic range of wines and cheeses. • Municipal Markets at Port Moselle – an absolute must for visitors to Noumea. Open from 5-10am every morning, it’s located in a cluster of blue-domed hexagonal buildings opposite the bus station, beside Port Moselle. • There are fishmongers as well as sellers of a fantastic range of fresh local produce. There is also La Buvette du Marché, which sells some of the best coffee and the most luscious buttery pastries in town. Friday, Saturday & Sunday are the busiest days with Monday being the quietest. • Crab Markets – at Farino on the second Sunday in each month, at Sarraméa on the fourth Sunday in each month. Sarraméa and Farino are located in the mountains about an hour north of Noumea. Stop by an information kiosk have further details. • Giant Omelette Festival – New Caledonia’s Giant Omelette Festival at Par Fayard takes place annually on the second week after Easter, during which a dozen chefs make a huge 3.5 diameter omelette using 7000 eggs. The festival dates back to the time when Napoléon and his army were fed omelette by Southern French villagers. • Avocado Festival Maré – Avocados from Maré, the second largest of the Loyalty Islands, are renowned for their high quality, which is celebrated during the annual Avocado Festival in May. • Festival of the Yam – The sacred Festival of the Yam marks the beginning of the yam harvest, and is the most important event in the Kanak calendar. Usually held around mid-March, the yam is treated with the respect usually saved for an ancestor. • Coffee Festival Sarraméa – August – The coffee plantation in Sarraméa, just north of Nouméa, is worth a visit. The 670 acre farm is located at the foot of the Dogny Plateau. The coffee is of such high quality, that former French President Jacques Chirac insisted on having it flown to Paris for his personal use. Shane Boocock would like to thank Karen Priest from New Caledonia Tourism for hosting him on this trip. He flew to New Caledonia courtesy of Aircalin, the International Airline of New Caledonia, that offers four flights per week from Auckland to Noumea.